Save on complete frame sets. Each frame set is specially designed to fit into your Revolution kite and comes with every rod needed to completely frame your Revolution Kite. We currently have 2 types of complete frame sets for you to choose from. The standard 1/4" frame set including the new Race Frame. The SLE frame set that has the larger 7/16" SLE leading edge. These frame sets are used on the Revolution Rev 1. 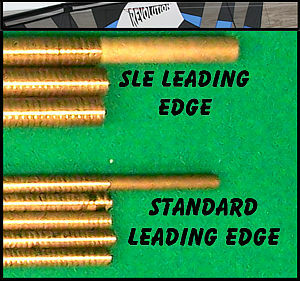 The above picture shows the difference between the standard 1/4" leading edge and the larger 7/16" SLE leading edge. Which Revolution shafts do you need? Read below for information on Revolution Replacement Frames. Revolution makes it very easy to customize your Rev 1 for your current wind conditions by standardizing the rods that are available. The standard rods and the larger SLE rods can be switched in and out of the Rev 1 without making any modifications to your sail at all. This allows for a huge amount of customization at a very minimal expense and no adverse effects. There are three basic rods that can be used in the Rev 1. The SLE rod is usually the normal leading edge rod supplied with the Rev 1. The SLE stands for Super Leading Edge. This is a larger diameter rod that is used in several of the Revolution kite models and is used in the Leading Edge ONLY. This larger rod measures 7/16" in diameter. The other rods used in the rest of the frame are always the 1/4" diameter or "standard" rev rods. The 1/4" rods are always used in the wing tip verticals but can also be used in the Leading Edges as a replacement for the SLE rods. The third rod is the Rev Race Rods, these rods are also the 1/4" diameter rods and can be used for the entire frame of the kite. The Revolution Rev 1 has the option of several different types of frames that can be used in it. The different shafts can be interchanged easily without any modification to the kite itself, even changing from the SLE rods to the standard rods is simple and easy to do without having to do any modifications to your kite at all. The end caps of your Rev 1 kite are specially designed so that they will fit inside of the SLE rod and on the outside of the 1/4" rod. To change between the two just slide out one rod and slide the other in. Using different rods or different combination's of rods will give you a different feeling of control with your Revolution Rev 1. The Revolution Rev 1 is also specially designed so that the wing vertical rod is the exact same length of the 1/4" Leading Edge End rod. This makes it easier to carry replacement rods. For basic hovering and increased precision, the standard 1/4" leading edge rods are preferred over the SLE rod. The extra flex that the 1/4" rod gives makes the Rev 1 less responsive and allows for slower, more controlled movements. The standard 1/4" leading edge is not as strong as the supplied SLE leading edge. The SLE rod holds the sail tighter and maintains the shape of the Rev 1 in a wider wind range which gives you a faster reacting kite that can be fun and exciting to fly. Teams tend to prefer the 1/4" leading edge where solo pilots seem to prefer the faster & stronger SLE leading edge. Each rod will have a certain amount of wraps of carbon on them. The more wraps of carbon, the stronger the rod. The more wraps of carbon the heavier the rod will be as well. The diameter of the 1/4" rod stays the same and can be interchanged in your Rev 1 without doing any special modifications to your kite or end caps. Just simple remove the rod and replace it with another. You can lighten up your Rev 1 for lighter wind conditions by changing the frame from the SLE rod to the Professional Use Only rods. This will give you better light wind response but will make your frame more delicate. The Professional Use Only rods are not recommended for use in stronger winds and can break under tension. Even changing from the SLE rod to the "Revolution Equipped" rod will lighten up your Rev 1. Normally you will not need to change out your vertical rods from the factory supplied rods. There is very little weight difference between the supplied verticals and the "Professional Use Only" verticals. Usually the only pilots who will change these our are the ones looking for the ultimate light wind Rev 1. Changing your entire frame from the standard frame to the "2 wrap" frame will give you a Rev 1 kite that is very close to the weight of the Rev 1 SUL kite. The Rev 1 SUL does use the "2 Wrap" frame but also uses a lighter weight leading edge material as well as a lighter weight sail and lighter bridle. Even putting in the "2 Wrap" frame you will still not equal the SUL for weight but you will get very close you will be able to fly in much lighter winds than the standard Rev 1 SLE could fly in. Hopefully this will help shed some light on the different rods that are available for your Revolution Rev 1. You may want to experiment with some different rods to customize your kite to your liking.